Carb-free pasta is now a thing and it’s awesome, freaks! My girl Laurie of liv-light featured Konjac plant pasta on her Instagram and I ordered some up because she’s always on point when it comes to yummy, low-carb, gluten-free meals. What is Konjac? It’s a plant native to Japan containing lots of fiber and absorbs water to help you feel full. The deal? Each packet (6 packs for $23 on Amazon available online here) is pre-cooked and takes 4 minutes to cook. All you have to do is drain the packet of noodles, rinse and drain under warm water for 2 minutes and stir-fry in a pan with your fave sauce for 2 minutes! The nutritional facts? 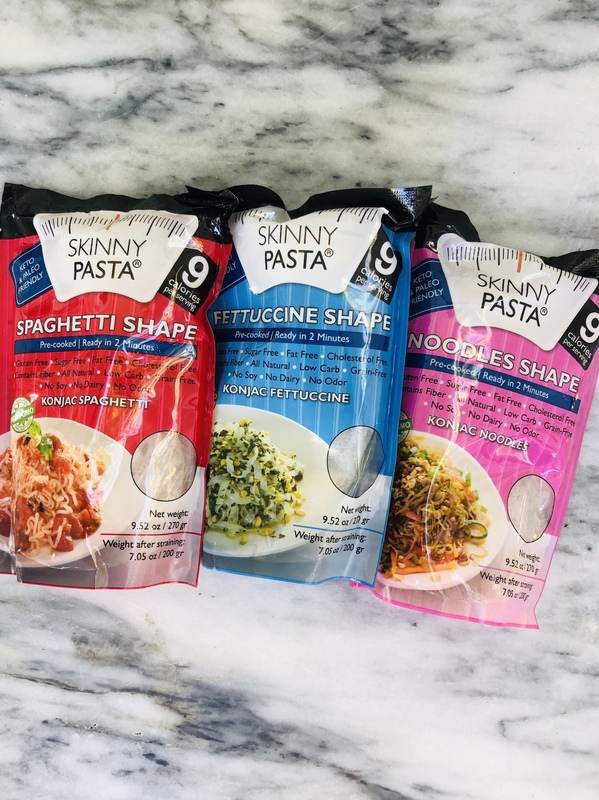 Skinny Pasta is keto and paleo friendly. Each packet (they are small, so one packet feeds one person) is 5 grams for carbs and 5 grams of fiber. We’re eating ours with my hearty bolognese sauce recipe — and without an ounce of guilt!